Friends, receive a warm welcome from your “Captain George”. To start off, I use the term “warm” because this is the best adjective I can use to anything related to this piece of paradise, the beautiful Island of Culebra and its people, because the warm welcome they give their tourists and visitors, leaves us with such a sweet feeling, we just have to come back for more! The first thing that you think of when you finally have your first boat is reaching the Island of Culebra. The boat owner today has to be conscious and not go off on the journey blindly; we can calculate a course with the compass if we have our destination in clear view, and of course, nowadays with a GPS, but we shouldn’t trust on it solely because it can malfunction at any moment. The nautical charts are still the basic and most trustful instruments that a captain can have to calculate paths and prepare a route. Let’s go to Culebra right at this very moment. The coordinates to reach Culebra are latitude 18.28 North and longitude 65.28 West. Using a language that won’t confuse the reader, we are aboard the “Sunnymooner”, a 26-foot long walk-around. I impart from Fajardo and pass in front of Palomino and immediately Palominto. Here’s where I turn and change direction on route to Culebra leaving Palominito in larboard and Cayo Largo in starboard, which is where many voyagers leave their illusions when they are left stranded. After having traced my course in my chart and making the conversion from real to magnetic North, the compass shows 120° when I angle my bow towards Punta Soldado. Traveling on a speed of 12 to 15 knots, I arrive to Culebra approximately in an hour covering 17 nautical miles between Fajardo and the “Isla Chiquita”. When I arrive I have a couple of options: I can hitch on the Municipal Pier, which is really close to the town of Dewey; many guest houses, for example in Ensenada Honda, have private docks where boat owners can arrive and sleep on land; or another option would be to carefully drop anchor in Fulladoza or Dakity. So here we are! Now, we enjoy. When falling in love with Culebra you must make a commitment that consists in respecting its corals, marine life and ecosystem that makes Culebra what it is: a true paradise. This pledge is also with its 2,000 residents. On my next article: buoys of anchorage, Ensenada Honda, Dakity and Culebrita. Why visit? 12 Reasons to Visit Culebra. Fall in Love with The Other Side of Culebra. Enjoy a relaxing time in the island. Captain George Sails. 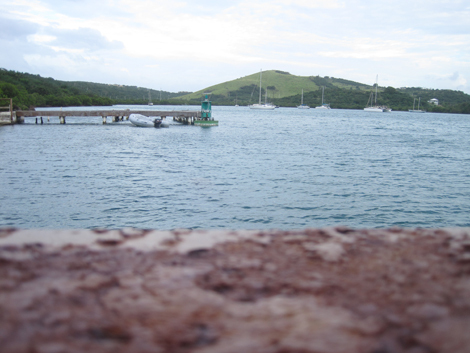 Travel to some of Culebra's keys.